"If someone gives up self-gratificatory pursuits and works in Krishna consciousness and then falls down on account of not completing his work, what loss is there on his part? And, what can one gain if one performs his material activities perfectly?" (Bhag. 1.5.17) Or, as the Christians say, "What profiteth a man if he gain the whole world yet suffers the loss of his eternal soul?" Material activities and their results end with the body. 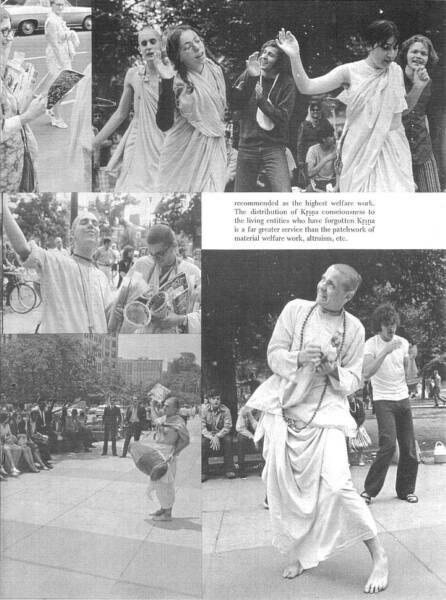 But work in Krishna consciousness carries a person again to Krishna consciousness, even after the loss of the body. At least one is sure to have a chance in the next life of being born again as a human being, either in the family of a great cultured brahmana or in a rich aristocratic family that will give one a further chance for elevation. That is the unique quality of work done in Krishna consciousness.